Natural Family Health Chiropractic offers caring, high-quality chiropractic care for your family to live to their potential. Dr. Meghan Van Loon, P.T., D.C. cares for pregnant women, infants, and children while Dr. Gerrit Van Loon, P.T., D.C. focuses on running mechanics and healing athletic injuries. 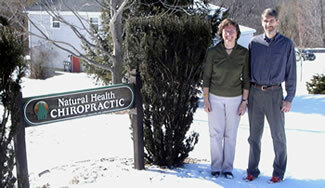 Their dual training in physical therapy and chiropractic ensures you get the best of both disciplines. Together, they work to enhance the wellness of your entire family. Please browse the navigation to your left to learn more about us and the unique services we provide. We specialize in a number of modalities including Active Release Techniques and Pediatric Chiropractic. If you are a new patient you can click here to download intake forms. If you have any questions or would like to schedule an appointment please feel free to contact us.